The Huawei P30 Lite is real and has been officially announced, despite not showing up at the massive P30 and P30 Pro launch in Paris at the end of March. The phone does share a strong family resemblance to its more technically advanced siblings, unlike the Mate 20 Lite that launched just before the Mate 20 Pro in late 2018. Just don’t expect all the camera goodies that make the P30 Pro so desirable. A triple-lens camera is on the back of the P30 Lite, comprising a 24-megapixel wide-angle lens, an 8-megapixel ultra-wide lens, and a 2-megapixel depth-sensing lens — no P30 Pro periscope zoom here. The software adds night mode, and there’s electronic image stabilization for video and artificial intelligence for scene recognition. The front camera has 32 megapixels, a portrait mode, and fixed focus. The 6.15-inch LCD screen has a 2312 x 1080 pixel resolution, plus a teardrop notch at the top, which looks larger than the one found on the P30 Pro. The bezels are slim, and the combination of the screen size and design gives the P30 Lite a screen-to-body ratio of 90 percent. On the back of the phone is a fingerprint sensor. The design on the back is similar to the P30; just note the lack of Leica branding for the camera — this one is all Huawei’s work. Three colors are available: A black, white, or blue. 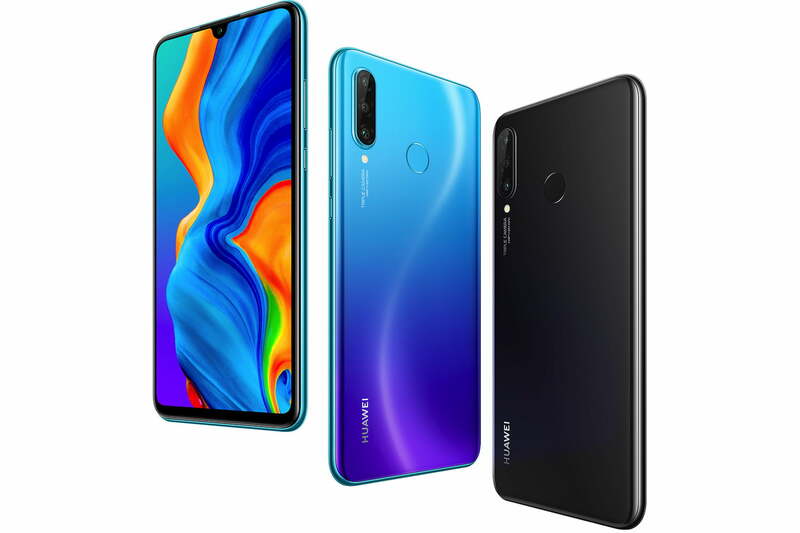 Huawei has chosen the Kirin 710 processor for the P30 Lite, with 6GB of RAM and 128GB of internal storage space, and it has installed Android 9.0 with its own EMUI 9.0.1 interface over the top. This is also different from the P30 and P30 Pro, which have the slightly improved version 9.1 installed. A 3,340mAh battery with standard fast charging (and not Huawei’s SuperCharge system) provides the energy using USB Type-C. A check of the official specification page shows the P30 Lite doesn’t have NFC for mobile payments, which is a shame. While Huawei has made the P30 Lite official, it has not been forthcoming with release dates or where it will be sold yet. It may arrive in Europe at some point, but will likely be released in parts of Asia and India first. The price will vary, but the Indian price is stated here to be the equivalent of $370.